The ever-increasing popularity of mobile apps has meant that the market has now become saturated with them, making it incredibly hard for advertisers to make their app stand out and drive downloads. 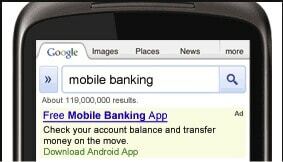 A highly effective way of increasing visibility for your app is to promote it through pay per click. One of the new features in AdWords Enhanced Campaigns is the app promotion ad format. This gives you the option of having a whole ad dedicated to your app, as opposed to an extension of your search ad (as discussed below). If your main goal is to drive downloads of your app then you should consider implementing these ads. The aim of this new ad format is to make it easy for you to drive downloads of your app by automatically doing much of the customisation for you. One way to promote a mobile app in AdWords is to create a mobile display campaign that will target users who are using an app that is similar to yours. This would be the prime time to target a potential customer, as they are actively engaging and seeking a product just like yours. Promoting an app within the search results is a great way to reach customers who are actively seeking for your apps and apps similar to yours. To promote your app this way you will need to create a search ad in the app/digital content format and use keywords related to your app to make sure that customers can find you. If your primary goal is to drive clicks to your website while giving customers the option to download your app, then you should consider implementing app extensions to promote your app. App extensions promote your app by displaying a link below your ad. A user who clicks on the ad headline will still be directed to your website, however a user who clicks on the app link can either download the app directly, or be directed to the app’s description in the App store. Ad extensions have recently been introduced to the ad rank calculation, which means that including them in your ads could increase your quality score. The introduction of ad extensions into the ad rank calculation has increased the importance of including extensions with your ads – as they could significantly increase your quality score. If you have an app then this is a great way to promote it and generate more downloads. If your primary goal is to generate downloads of your app then you should consider implementing the new app promotion ad format. These ads make it really easy for customers to download your app and the ads are also very straightforward to set up, making them a win-win all round! If, however, your main goal is to generate clicks to your website then you may instead consider implementing app extensions within your search ads. The app extension appears below your ad, meaning that customers have the option of clicking through to your website, or downloading your app straight from your ad. Do you have an app that you promote using PPC? What have been your experiences? Or perhaps you don’t yet use this method of promotion, is it something you would consider? We’d love to hear your thoughts.